Helen Skelton's dad has his say on her Rio Olympics outfits | HELLO! 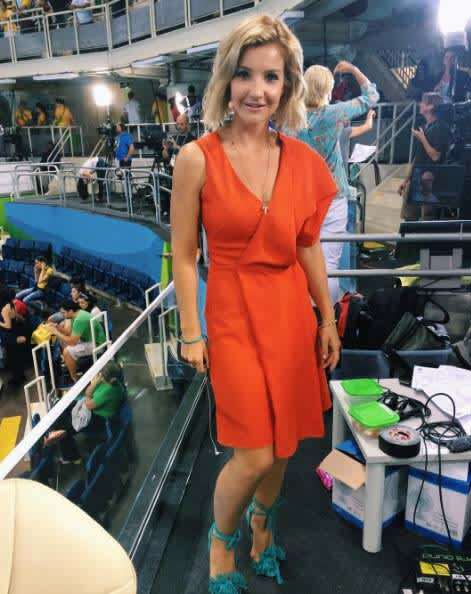 Helen Skelton has been making a splash during her presenting duties of the Rio Olympics for the BBC, but rather than talking about the swimming events she is covering, many viewers have been more focused on her outfits. The 33-year-old has attracted a lot of attention from the media due to her fashion forward looks, with some publications suggesting that some of her dresses were too short. Now Helen's father Richard Skelton has had his say on the debate, calling in to ITV's This Morning to say he felt the focus on his daughter's sartorial choices was a "non-story". Speaking during a segment called "Too Racy in Rio? ", Richard said he was "surprised" Helen's outfits had made the front pages of many newspapers. "I thought we'd moved on from this, obviously we haven't, she's just out there doing a job," he said. "She's worked very hard. She's obviously more bothered by the Olympians. She loves live TV. And she is simply a young woman in a hot place in a skirt." When asked whether Helen had been upset by some of the comments, Richard replied: "Not at all. I don't think she's really aware at what's been said. Why do we always have to comment on women's clothes?" He added: "I'd be the first to tell her if I thought it was inappropriate!" Indeed Helen appears unfazed by the style scrutiny she has been experiencing, and continued to share photos of her outfits from each day on Instagram. The mum-of-one has been wearing a number of both high street and high end designs including pieces from Whistles, Edeline Lee and Brazilian designer Alexander Lewis. What do you think of Helen's outfits? Let us know in the comments below.